The world economy exhibited several welcome developments in 1999, including continued strong growth in the United States, tentative recovery in Japan, some increase in activity in the European Union and a robust recovery in the Asian economies hit by the recent crisis. These developments combined to raise global growth estimates by almost one percentage point more than the pace forecast at the beginning of 1999. Led by the strong recovery in the crisis economies, the developing economies of the ESCAP region achieved growth of 5.5 per cent in 1999 in sharp contrast to nearly zero per cent in 1998. Growth at over 6 per cent is projected for 2000. The improved performance was shared by all the subregions with the exception of South and South-West Asia. Fourteen out of 25 developing economies in the region achieved higher growth in 1999 than in 1998. The two principal contributory factors were fiscal stimulus and a much stronger export performance. Overall, 16 developing economies recorded higher growth in merchandise exports in 1999 than in 1998. Fiscal stimulus and larger exports helped to increase capacity utilization and contained the rise in unemployment. Business and household confidence were also boosted. This was reflected in rising stock markets, stable exchange rates and moderate recovery of external capital inflows. The crisis in the region in 1997 exposed the inadequacies in providing vulnerable sections of society with social protection against contingencies such as involuntary unemployment. Large sections of the population of developing countries in the region, especially in the unorganized sector, remain virtually excluded from any form of social security. The expansion of appropriately designed and financially viable social security and safety net schemes, involving both the state and the private sector, deserves urgent consideration. 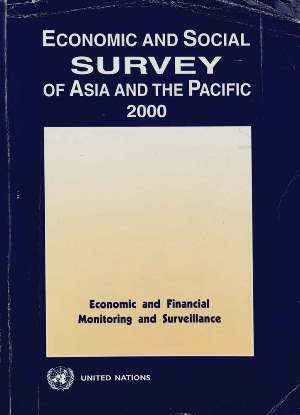 The contagion phenomenon which became apparent during the crisis and the associated economic and social costs have heightened the need for regional and subregional surveillance mechanism to provide early warning of impending crises for all countries in the region. There is considerable scope for enhanced regional cooperation in this crucial area.